DAg ARt is a collective that formed as an investigation into street art. The group started with stencils and moved on to small-scale collaged stickers made from images and text cut primarily from magazines. DAg ARt takes the text and images from these magazines and subverts the imagery by juxtaposing different elements. The use of humour and sometimes-obscene pieces from magazines create works that are at times crass and offensive. Since the formation of DAg ARt, thousands of stickers have been made with the majority being put on display on the streets of Sydney, Newcastle, Melbourne and Hong Kong. The exhibition will include a wall of small collage stickers (up to 1000). DAg ARt specialises in juxtapositions and common themes of the works include celebrity, the media, body image, Brad Pitt, body builders, Heath Ledger, bad puns, one liners and people as they are represented in magazines. 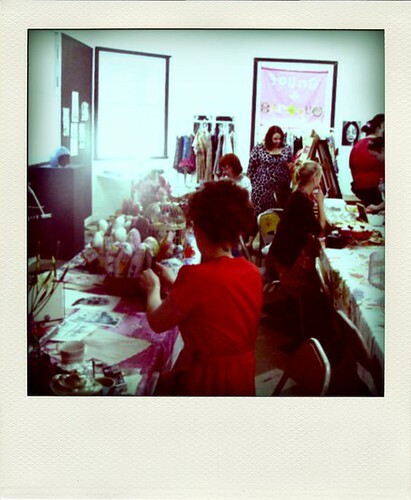 The Young and Baroque Artist Market is on at ARThive Gallery! This boutique market will be specifically tailored to a woodland setting and we are looking for stall holders to respond to this theme. If you want to come down to the woods today please send an email to subjecthive@gmail.com by 21st February! 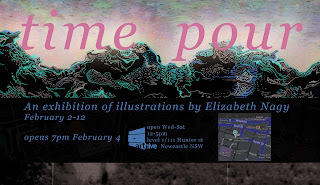 Time Pour is the solo exhibition of amazing Sydney based artist illustrator, Elizabeth Nagy. After graduating from the Sydney College of the Arts in 2009, Lizzie placed her art practice on hold in the pursuit of becoming a midwife. However, after producing works for donations to Non Government Organisations such as FRANS, Amnesty International and FBi radio, she is now getting right back into creating and we are super excited to be presenting her current work to you! The exhibition will showcase Lizzie's recent adaptation of coloured pencil and marker into her previous style which was predominately liner based illustration. Her highly time consuming drawings and collages are illuminated with fine detail and affectionate mark making and for this exhibition are centred around themes of time and the pressures of creating as a young illustrator. Inspired by childrens illustration, folk art and craft and collage, Lizzies work is a thought provoking fusion of figurative and fantastical landscapes, typography, anatomy and mythological creatures. Listing influences such as Shaun Tan, Tohby Riddle, Adrian Tomine and Cristy Road, Time Pour shall be an illustration extravaganza not to be missed!